September 25, 2015, Victoria, BC (ISN) – The Victoria Royals used a three-goal second period to cruise to a 4-1 win over the Portland Winterhawks in the opening game of the Western Hockey League (WHL) season for both teams Friday night in front of a near sell-out 6,627 fans at the Save-on-Foods Memorial Centre in Victoria. Friday’s opener featured a new-look Royals team, one considerably younger than last year, with just a combined total of just six 19 and 20 year olds, 10 new faces and seven true rookies. The always powerful Winterhawks also re-tooled significantly over the off-season, having lost nearly 40% of their offence from last season due to the graduation of such players as Nic Petan, Chase DeLeo and Oliver Bjorkstrand. As a result of the changes, the nearly full-house was not sure what type of game to expect from either team, but what they saw in Friday’s first period was a quick, fast-paced game, with great scoring chances from each side and with the starting goaltenders for each team – Coleman Vollrath for the Royals and Michael Bullion for the Winterhawks – making some big saves early to keep it scoreless. The scoreless battle would come just 1.3 seconds short of getting carried over to the second period, as the Royals Jack Walker would open the 2015-2016 scoring with a pretty goal just before the buzzer, taking a nice two-on-one pass from Alex Forsberg and snapping it over the shoulder of Bullion to give the Royals a 1-0 lead. Last minute and last second goals are always big for any team and the Royals used that one to explode for three more goals in the second period, starting with a goal from Vladimir Bobylev just 2:19 into the frame. The Winterhawks could not clear the zone along the wall and the Royals Forsberg picked up a loose puck and flipped a nice cross-ice pass to Boblylev, who skated in and made a pretty move to beat Bullion. Just five minutes later, on the powerplay, Dante Hannoun notched his first of the season, picking up his own rebound, curling around the back of the net and wrapping one in off Bullion to give the Royals a 3-0 lead. Forsberg, starting the season off on the right foot, had his third assist of the night on the goal. The Royals, to that point of the game, had outshot the Winterhawks 17-7 and while the Winterhawks regrouped a bit after the Royals third goal, they would surrender yet another, when the Royals Ryan Peckford tapped home a rebound – his first career WHL goal – with 4:36 to go in the period to give the Royals a 4-0 lead. In the third, the Winterhawks started the period strong, spending the first two minutes pressuring in the Royals zone and ultimately outshooting the Royals 11-6 for the frame. They would be rewarded for their better play with a goal at the 13:10 mark, as Portland newcomer Carl Ericson skated in on the wing and wristed a laser up and over Vollrath, spoiling the netminder’s shut-out bid. 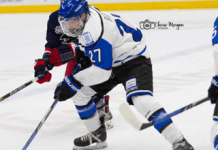 The Royals’ line combination of Forsberg, Bobylev and Hannoun looks like it could be a keeper for the season, as they accounted for seven points on the evening, with Forsberg earning three assists and Hannoun and Bobylev a goal and an assist each. The Royals and Winterhawks are right back at it on Saturday night at 7:05 pm with game two of the series and game two of a six-game homestand that opens the Royals season. 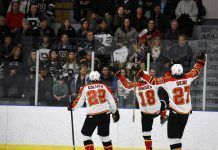 Other games in that homestand include a pair against the Kamloops Blazers on Oct. 2 and Oct. 3 and a pair against the Spokane Chiefs on Oct. 6 and Oct. 7.